“I doubt that the energy I feel inside me is mine. I do not create music – I just write down what has been sent to me”. These few words by Latvian composer Rihards Dubra tell us much about his strong religious beliefs. He also stated that “just as everyone has their own pathway to God, so every composer has his own pathway to emotion in music, and through that – also to God”. As with many of his contemporaries at that time, Dubra began his musical studies during the Russian occupation in Latvia and – as Rupert Gough puts it in his excellent notes – had to confront the authorities. Could a composer having composed a Christmas Trio have avoided such confrontation? Nevertheless Dubra stuck to his faith and his deeply rooted ideas, and persisted in composing sacred music. Several of his orchestral and chamber works bear a religious programme. These include his Little Symphony No.3 (1992) subtitled “The Glow of Divine Beams”. An important part of his present output is to be found in his sacred choral music. This includes a large number of short unaccompanied works but also some more substantial pieces such as Cantata in Nativitati Domini (2000 – tenor, chorus and orchestra), Levavi oculos meos in montes (soloists, chorus and orchestra) as well as the impressive Te Deum (2002 – massed choirs, violin, saxophone, horn, percussion and organ). Dubra’s name and music must be new to many as it was to me until I had the opportunity to review a disc of Latvian organ music (MANSCD LCLA 026) including an organ work of his, The Longing for Eternal Hills (1995). Some time later I found a disc including his impressive Te Deum in one of my Brussels haunts - second-hand record shops. The present release not only adds considerably to one’s appreciation of Dubra’s achievement but also tends to confirm certain characteristics consistently featured in his music. From this point of view, the first two items on this disc Oculus non vidit (1993) and Ave Maria III (1994) are representative of his often imaginative word-setting and his resourceful choral writing. This is achieved through a highly satisfying mix of tradition and innovation, the latter in the form of controlled improvisation or near-improvisation to which he regularly resorts either to create vivid aural landscapes or to have the music moving to a dazzling climax. Thus Dubra’s setting Oculus non vidit ends with the repetition of the words “qui diligent illum” (“who love him”). The repetition of the motif grows in intensity and eventually gives way to an aleatoric crescendo leading to an inconclusive ending, again something that recurs quite often in his choral music. The opening of Ave Maria III has the sopranos chanting words suggesting several people humbly praying. In fact this was inspired by three elderly ladies reciting the Ave Maria, each in her own manner but “sounding strangely unified”. I will not go into detail about every work recorded here because many of them are pretty short and because the music speaks for itself. I should however mention Hail, Queen of Heaven (2007) which is the longest and the most substantial item here. The text is by John Lingard (1771 – 1851) after Ave Maris Stella. The piece is also somewhat more developed since each of the text’s three stanzas is given its proper setting. Unity is achieved through the use of a refrain at the end of each stanza. The work ends with a shortened restatement of the opening. I am in no doubt that this is the finest work here and a minor masterpiece on its own. The Missa de Spiritu Sancto was commissioned by the Lithuanian Academy of Music. It is for upper voices and organ. The music is more straightforward than many of the other works here perhaps because it was written for liturgical use. The music, however, is as inventive as ever including some livelier sections such as the Gloria and the Sanctus. A few of the pieces are simpler such as the short carol Hodie Christus natus est, Ubi Caritas written for the wedding of friends of the composer and Ave Maria I – the earliest work here – that may bring Gorecki to mind - e.g. his Totus Tuus. As already mentioned Dubra’s choral music is a most satisfying mix of tradition and innovation that is entirely personal. His music is quite unlike that of Tavener or of some other Baltic composers including Pärt. Repetition is a constant but this is word repetition - musical phrases are constantly varied and the music moves towards a goal rather than repeating itself in a more static way. Dubra’s music is in a quite different league than, say, Pärt’s tintinnabuli. More importantly, it is beautifully written for the voices – remember that Dubra has sung in several choirs – although it is far from easy and must pose many problems of intonation that are fully mastered in these immaculate performances. 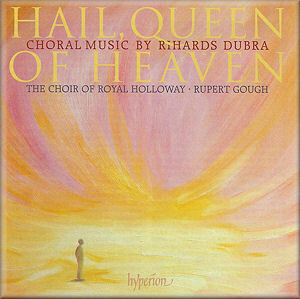 The singing of the Royal Holloway is a pure joy from first to last and the recording does them full justice. I cannot but urge you to get this magnificent and generously rewarding release. My only regret is that it came too late to be included in my list of Records of the Year 2009.